Northern British Columbia is a land of myths and legends. Out of the vast land of white water, creeping glaciers and dense, ancient forests come tales of a wilderness steeped in mystery and adventure. The North is a land where ancient totems loom in the forests and aboriginal culture is not just vibrant, but alive and well. It is a place where humble grizzly bears shamble along creeks and trophy salmon hurl themselves upstream. The North is a long-lost land of dinosaurs, a place where the Northern Lights mesmerize the most hardened travellers and the people still live off of the land. The stuff of legends and tales all around the world, Northern British Columbia's mystique comes from its enormity and close ties with the wilderness. As a region it is largely undeveloped and populated by small communities nestled amongst steep mountains. All through the region wildlife roam the steep mountainsides and valleys. Black and grizzly bears are abundant, as well as moose, mountain goats and caribou. Photographers, artists and nature enthusiasts spend time in the wilderness hoping for a sight of these magnificent animals. In the misty coastal rainforests, only those with luck and good eyes will catch a glimpse of the white kermode, or spirit bear. As an extremely rare and protected species the kermode is spoken of with wonder and awe all across British Columbia, but in the city of Terrace the animal has been adopted as a municipal symbol. Dinosaurs have come to represent the town of Hudson's Hope. During the construction of the W.A.C. Bennett and Peace River Dams an area rich with prehistoric fossils was unearthed. The Hudson Hope museum boasts a good collection of fossils, its prize piece being the remains of Hudsonelpidia Icthyosaur, an Upper Triassic dinosaur named after the town. For visitors, fossil hunting through the Peace River valley offers a chance to bring prehistoric monsters to life. Legends and myths are alive in the moody and secluded beauty of the Queen Charlotte Islands. Accessible only by plane or boat, the Islands hold some of the most spectacular and isolated scenery in the province. Jagged mountains and fjords rise from the sea and are shrouded by Pacific mists and ancient mysteries. Traditional home to the Haida nation, the Queen Charlottes hold some of the province's most vibrant and lively aboriginal culture. In Gwaii Haanas National Park old village sites and age-old cedar totems stand silently, looking out to sea. In the towns around the island, native artisans display crafts and carvings made from cedar, silver and argillite. The Haida Gwaii museum, a cedar post and beam building on the beach, provides visitors with an orientation to the Queen Charlottes and Haida culture. 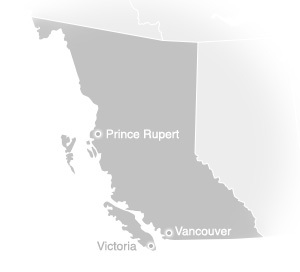 Northern British Columbia has always been dependent on resources and deeply invested in industry. Some of the more fascinating projects offer tours for visitors. Work at the Bullmoose coalmine near Tumbler Ridge involved the removal of a mountaintop, and the hydroelectric dams on the Peace River are some of the largest earth-filled structures in the world. The most famous example of a British Columbia engineering marvel is the Alaska Highway. Built in 1942, the highway starts in Dawson Creek and stretches 2,347 kilometres (1,462 miles) into Alaska. It crosses eight mountain ranges and 133 bridges and was completed in eight months. The highway is now one of the main transportation corridors in Northern BC. Cutting through the rugged northern heart of the province, it is one of the most remote and scenic drives and a popular tour with visitors. Northern British Columbia is a land of rugged wilderness. From the wild rivers and deep forests have come legends of great animals, native myths and tales that are told around the world. Visit, and explore its mysteries for yourself.